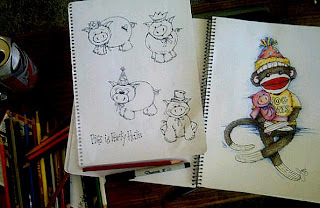 Pop Art Minis: Paint Party Friday...Pig Daze and Party Prep...Sounds P*E*R*F*E*C*T! Paint Party Friday...Pig Daze and Party Prep...Sounds P*E*R*F*E*C*T! YAY! It's Friday and I'm still on vacation! Ok, that deserves a double YAY! YAY! And it's also the kick off of Piggy Days (Hog Days officially, but I had to keep with the "P" theme in the title) in Kewanee, IL which means tonight is the night of the "Hog Daze Face Time Friends Get-Together". 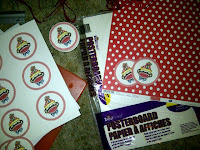 And until it's time to leave for that there's still more party prep time for tomorrows Sock Monkey Birthday Party! But, enough of the small talk...let's get to the artful goodies for today! My inspiration is all about the Piggies...in honor of my hometown Hog Days Celebration, of course! 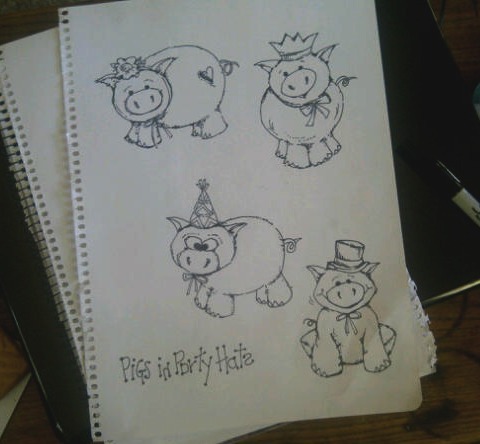 Silly piggy sketches from black and white to "pops" of pink. 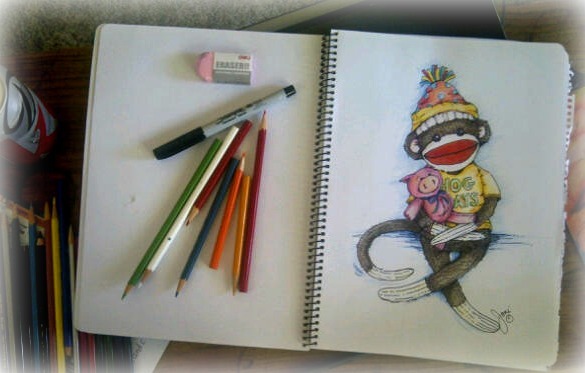 And I couldn't leave out my recent sock monkey obsession! 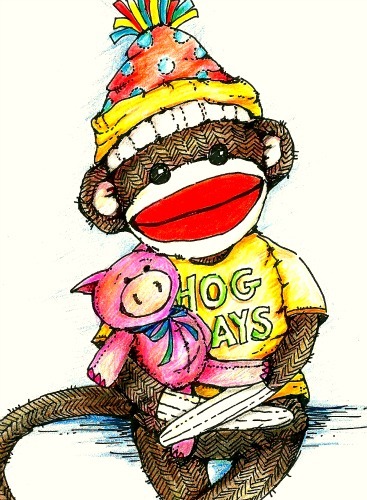 A Sock Monkey with a piggy pal and sporting a Hog Days T-shirt! Ok, that's ll for now! 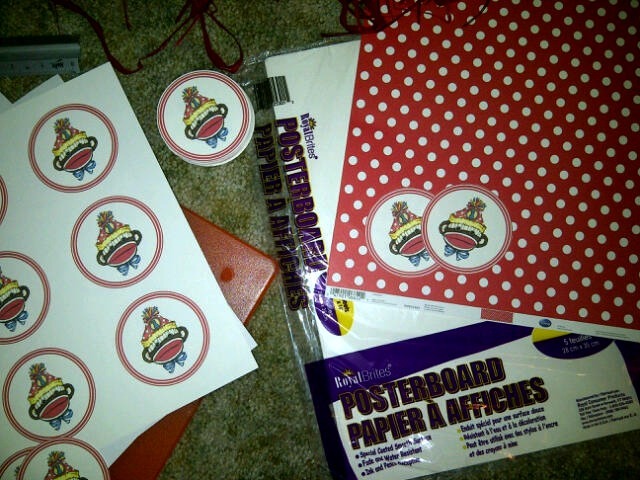 Back to the sock monkey party prep...there's still decorations to complete and food to make so we can eat! And before too long I'll be putting on my cute new pants...hehehe! so I can head to K-town to spend time with good friends and DANCE! It's Happy Dance Friday after all! Hope your day is filled with the perfect mix of good friends, party time and sock monkey fun! Shared over at Paint Party Friday. Be sure to pop by, join in the fun and check out all of the amazingly creative awesome peeps! OMG so Cute!! Love your pigs & still smitten with your sock monkey!! Omg! These piggies are adorable! And coupled up with a sock monkey! It doesn't get any better than this. :) I love these bright colors. How cute! I love the sock monkey and the pigs. You are so talented. Great work. 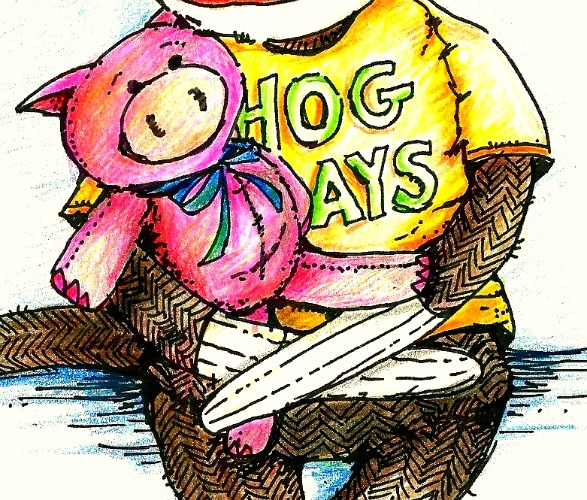 Have a fun time at the Hog Daze events. That monkey is ADORABLE!!! :) I love the herringbone detail in the sock texture. Gorgeous work! Wow..awesome post of such gems! and i am so in love with your sock monkeys!! adorably charming!! Your piggies are super cute! And of course one of them had to become a friend of Sockmonkey!! Love it! those silly piggies gave me a giggle, what a cute combo they make with sock monkey! 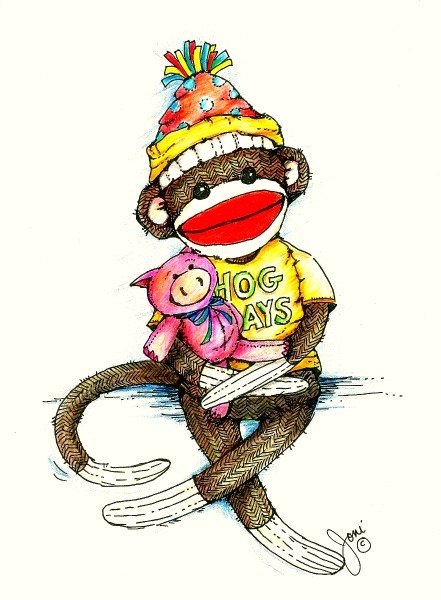 I just LOVE your pigs and he looks adorable with the monkey too! Are you near Paw Paw...or is that Pau Pau Illinois? Didn't think it was possible for the sock monkeys to get any cuter...turns out I was wrong. Just add pigs! Those pigs are so dang cute!! And I thought only Louisiana had weird celebrations like that. The piggies are delightful and of course I love the monkey! Gosh - I wish I could draw. You are very clever. Can you give me a link to your alphabet soup? so so so adorable! Love them so much! 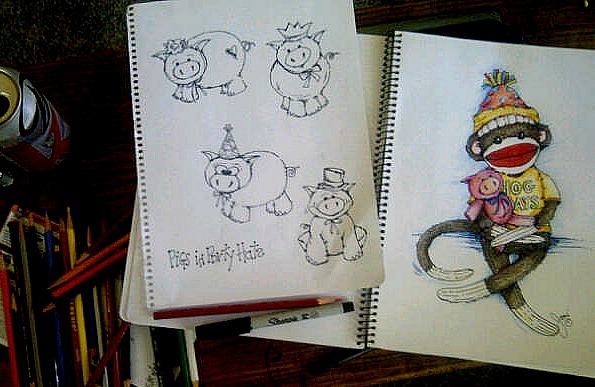 It's very lovely how you color the little pigs and the monkey. Perfect for a party yeah! 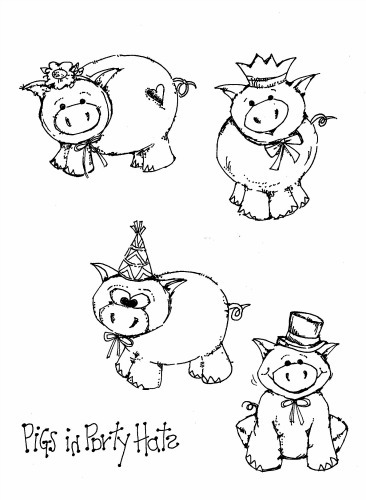 I love those wonderful drawings of pigs full of magic and excitement. On my son's favorite toy is also a pig. Adorable monkey w/ pig. You're so talented and clever. Love the pigs and CUTE sock monkey :) Nice colors too! Oh my gosh - I love this... perfect pink piggies and an adorable sock monkey! What could be better?!? It sounds like you're having lots of fun - Enjoy!!! awwww so adorable! I love everything here! You got all kinds of CUTE this week don't you? Always enjoy visiting your works! Happy PPF! Oh I love your piggys. They are so cute. As a child we had little piggies on the farm. Great job,wonderful paintings. I love seeing your cute creations each week. 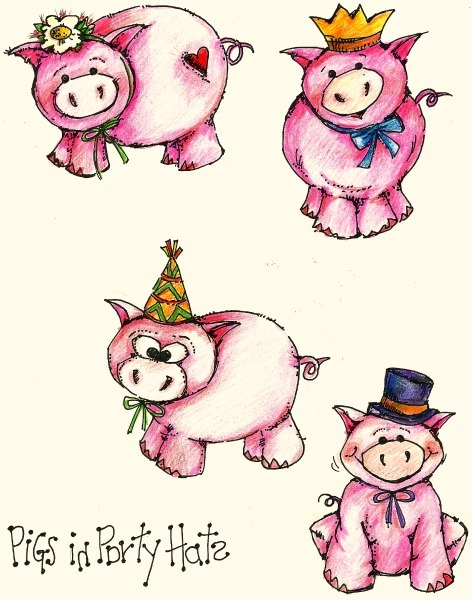 I mean, those piggies...SO, SO cute! I am sure the party was a huge success. LOL! Adorable piggy's to add to the incredibly cute sock monkeys. Have fun at the festival!